How many other moms have heard that phrase in the last week? Your child brought one cup down to the kitchen, threw his covers on his bed, and put one pair of dirty underwear in the hamper. Also, you can insert any other scenario into the above: finished my homework, helped my little sister with reading, loaded the dishwasher… Then, add, “Can’t I just do it tomorrow?” for the cherry on top and you have the formula for one crazy mom. 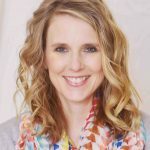 Y’all – we’d take a bullet for our kids – but we will get to the point in teaching our kids responsibility that there is no way we are putting away their cereal bowl…again. How can we get our kids to understand that their actions reflect who they are as people? 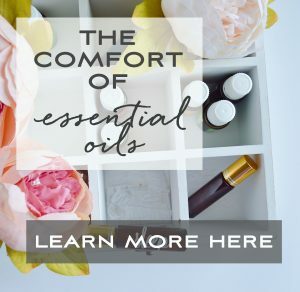 How do we help them to comprehend intrinsically that when they take care of their responsibilities, they are learning how to be organized, independent, and lead through example? How do we shape these young minds to realize that accomplishing working hard with integrity now in the little things, will greatly help them thrive in the big things to come? This is something I’ve been using in my home (and my high school classroom) for the past year. We focus on teaching leadership through transformational phrases we interject into our daily language, as it feels natural. We watch as the message slowly seeps into our kids’ hearts and take root. Why does transformational language focused on leadership work (the science behind it)? There are three needs every human being craves: safety, belonging and mattering. These qualities, according to Forbes magazine are “essential to your brain and your ability to perform at work, at home, and in life overall.” We’re going to the focus on the third quality– we all want our lives to matter. Something deep in all of us pulses: we want to be strong human beings that contributes something “worthy” to this world. We want to figure out how we can make an impact, we need to be leaders in our own lives. Intrinsically, we crave steering our own ship and our work mattering. What about leadership should we focus on and how often? Leadership is a huge topic; every corner of the world needs good leaders – in politics, in communities, in our homes, in our personal lives (self-leadership). Don’t lead by force; lead by example. 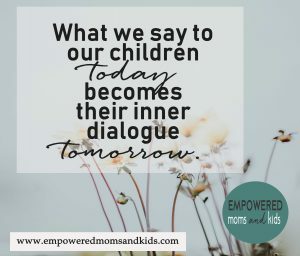 Before we dive into how we, as parents, can incorporate transformational language into our every day that will shape our kids into leaders (who serve a higher purpose and lead by example), let’s first tell our kids about this new perspective through a dinner conversation. Your everyday actions matter; your effort now will build the leadership skills you will use later. How you work reflects directly on you (People judge who you are by your actions, whether you like it or not – that’s reality). Who of those individuals do you think is good at leadership? What makes that person a good leader? Answers will range and important qualities will be talked about including having a vision, being kind and instilling inspiration, but we want to guide the conversation towards this point: A good leader takes care of his/her responsibilities. 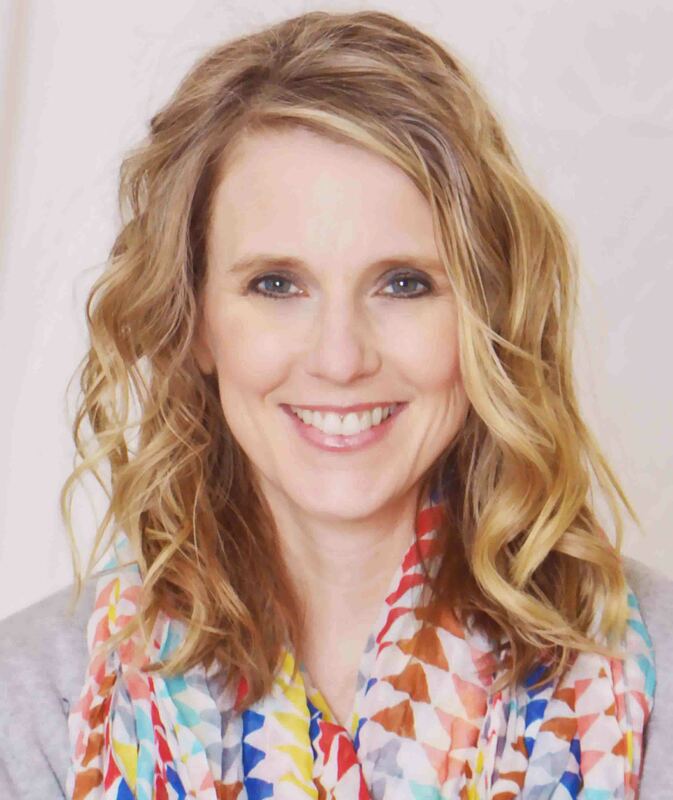 Would you think this leader, perhaps your soccer coach, is a good leader if she didn’t come prepared? What if she didn’t take the time to come up with a game plan for the practice, set up the necessary equipment well…etc. Does this soccer coach need her mom to come and tell her to be on time, make sure to set up the field with the cones and equipment for the drills and do a job well done? Do you notice your coach’s actions? Do your coach’s everyday actions reflect the kind of person she is? Explain. Again, the answers will be different, but you’re trying to have your kids see how exactly zero good leaders has his/her mom nagging them to do a good job! What are your responsibilities right now? Do you do them well on your own, or is your life filled with people bossing you around? Describe changes you will make to be a leader in your own life. Incorporate transformational language that will help us raise kids to be leaders. Moms, you must promise me this: This is not a stressor into your life. There is no exact right or wrong way to do this and you will not beat yourself up if you think you are failing. You’re not. You’re a champion. Always. Keep that in mind as we proceed. 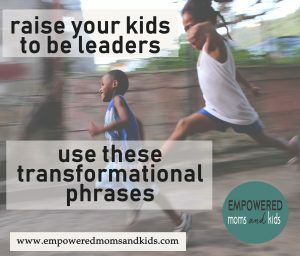 In our everyday conversation, we want to work on using transformational language that shapes our kids into leaders. (As it feels natural, when you remember, we don’t need to overkill this.) In other words, parent backward. 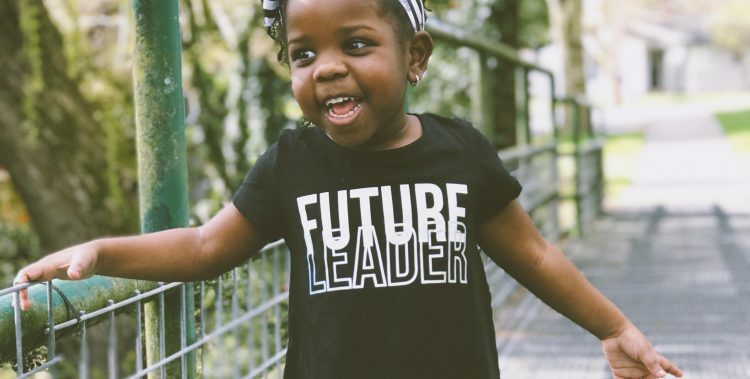 Think about the successful, independent, confident adult you want your child to grow into and ask yourself: What do I want my kid to do and learn from this situation that will help him grow into a leader? Setting their alarm and getting out of bed. You’re a leader – you don’t need me to get you up, leaders are in charge of themselves. Getting dressed, brushing teeth, eating breakfast, putting shoes on, PUTTING ON DEODORANT…etc. You’re a leader – leaders don’t have the moms follow them around and nag them about getting ready. Having a backpack together, being at the bus stop on time…etc. You’re a leader – leaders lead by example. Your teachers and peers will notice that you are prepared. Pay attention, take good notes, stay focused in class, do what’s expected. You have a leader – leaders have a purpose, your purpose right now is to do well in school. Connect with peers. You are a leader – leaders notice other people and are kind. (Especially if they are struggling.) You are a leader – leaders know people (even teachers) can be difficult and try their best anyway both to get along with the person and thrive in the situation. Homework/studying. You are a leader – leaders challenge themselves to learn new things. Chores. You have a leader – leaders contribute, even when they don’t feel like it. More chores. You are a leader – leaders learn to live a disciplined life where they take care of their responsibilities. Even more chores. You are a leader – leaders do a good job. Helping siblings. You are a leader – helping your siblings will grow your leadership skills. Getting Involved in activities. You are a leader – leaders learn about themselves by finding out what they are good at and how they can share their gifts in this world. Going to practice, even when you don’t feel like it. You are a leader – leaders follow through with commitments. Trying out for a team/auditioning for a show. You are a leader – leaders step out, even if they are afraid to fail. You will grow from this experience no matter what the outcome. 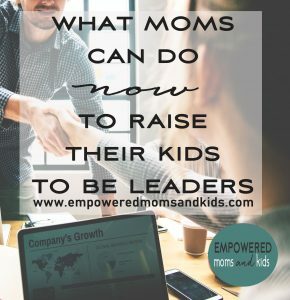 But when I answer my son with, “Hey – you’re a leader, right? You know when your room looks clean. Do you really want me to come up there and boss you around? 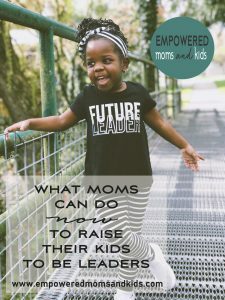 Do leaders need bossy moms?” his shoulders straighten a bit. He doesn’t necessarily go back to the task with enthusiastic vigor, but I’ve planted a seed as to why his actions now matter. And I’ve given him an image of the leader he might someday be. 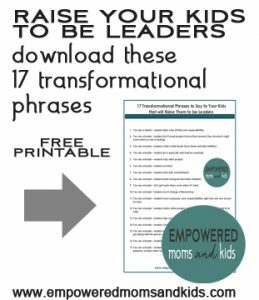 Moms – I created a printable with 17 Transformational Phrases that will you raise your kids to be leaders. Put it on your fridge or tuck it into your journal to refer back to later. Grab it below. 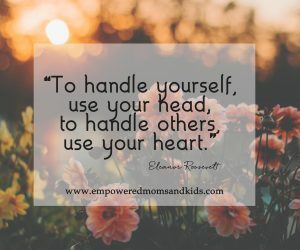 Plus, I’ll email you a link to my Empowered Moms and Kids library where you can download lots more empowering freebies to empower you and your kids. I wish I would have implemented this when mine were younger. I’m still going to plug it in whenever I can. Thank you!! !